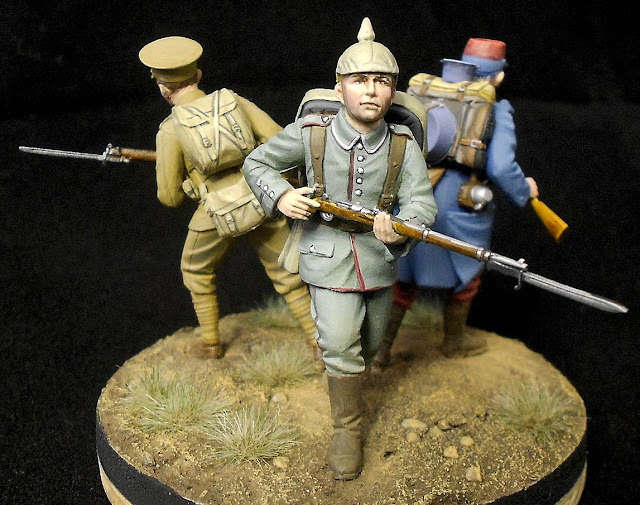 Product Link on the Revell of Germany Website. All over Europe, 4 years of war that took place a century ago, are being commemorated. 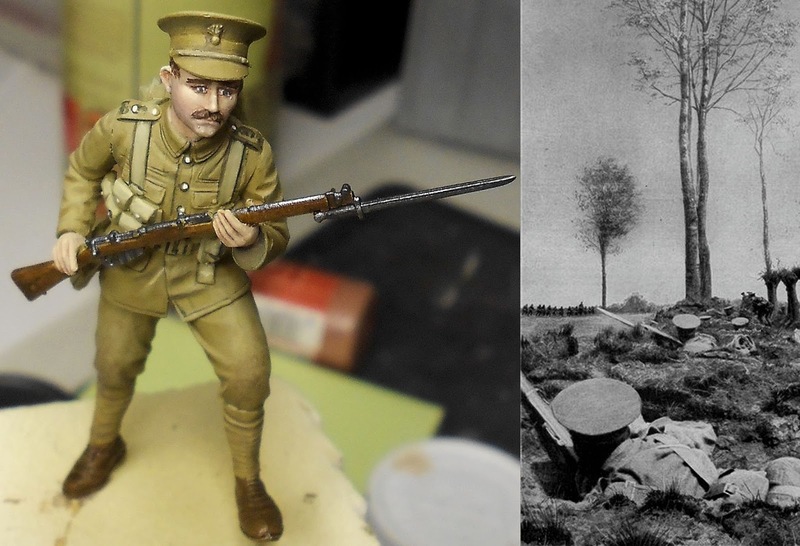 The first World War has long been forgotten by model companies, but the centennial has changed that. Aircraft, tanks and figurines have been released by quite a few companies. 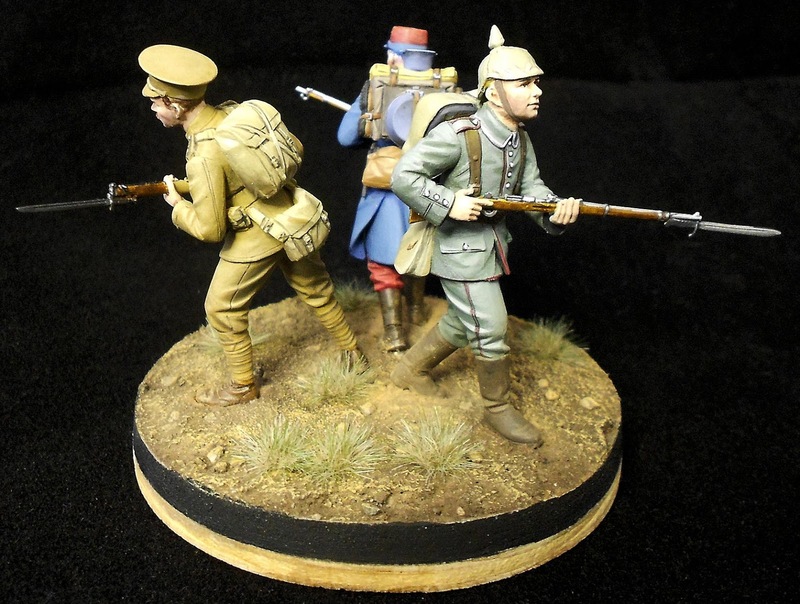 Revell’s release of these World War I figures are a great addition indeed! 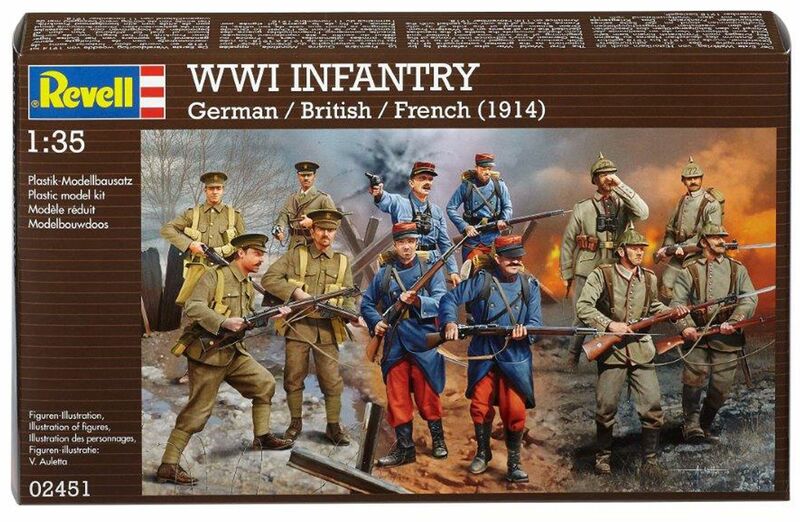 This box actually contains 3 sets of re-boxed ICM World War I figurines: German, French and British soldiers at the beginning of World War One. Each set has 4 figurines, so the Revell box has 12 in all, with a whole lot of extra parts that you don’t have to use, but might come in handy for anyone building WWI dioramas. Building all twelve of them would lead us too far, but we still wanted to know how they would go together. François and Nicolas teamed up to build some of them. 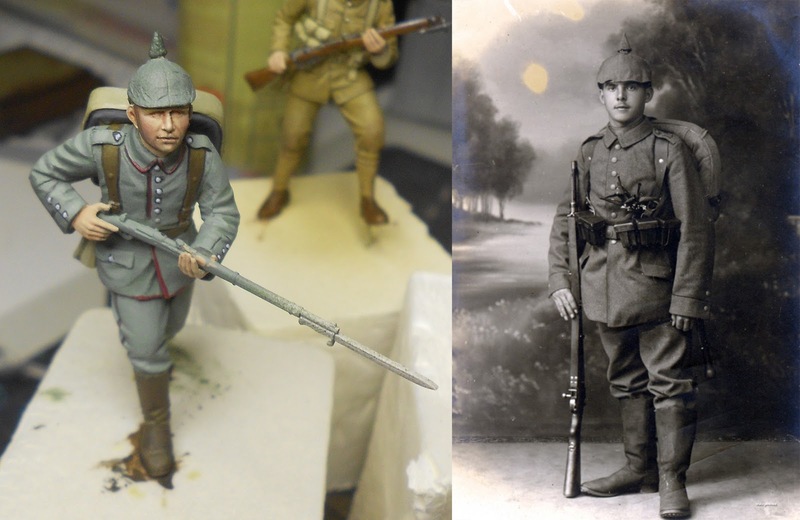 Here is one of the German soldiers built up. 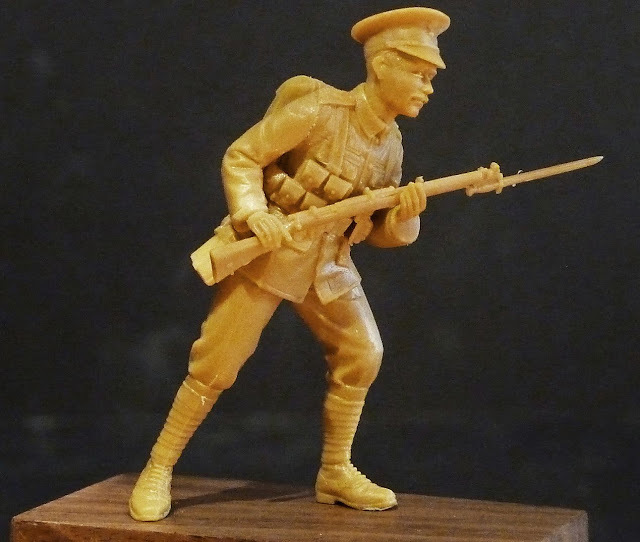 The figurines are very nicely done and come with all necessary detail. Not having much experience with figurines, Nicolas found them not easy to construct and this was due to the unclear plans Revell provides in this box. 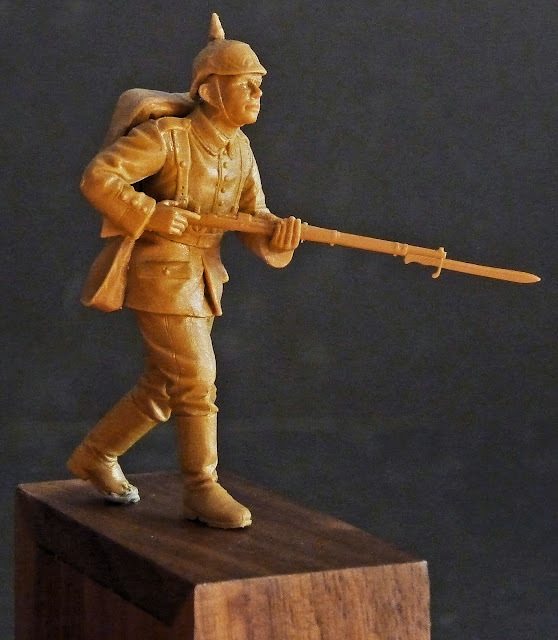 The accessories are simple enough, but the figurines themselves have to be built from a constructed view only. This proved to be especially difficult for the French soldiers, with their odd looking coats. 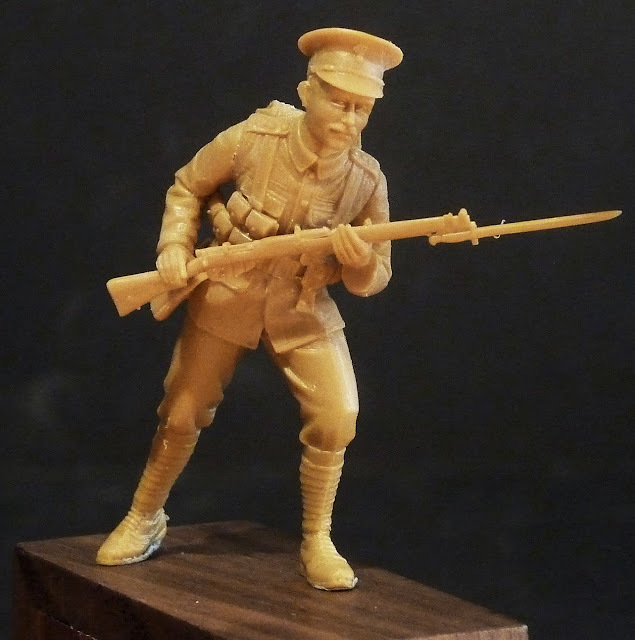 The British soldier has quite a dynamic pose, and like the others in this set, is very nicely moulded. The face has a realistic expression indeed. 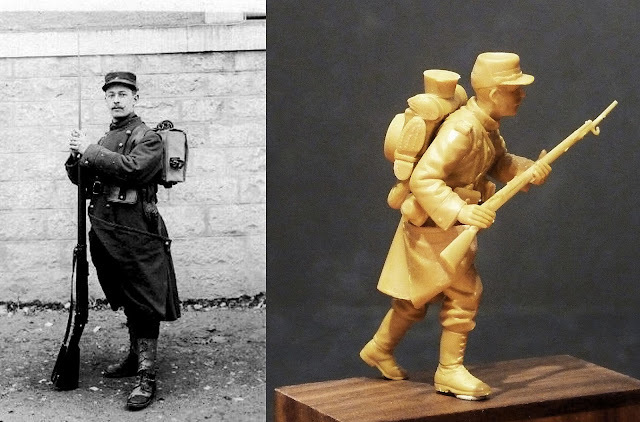 The French soldiers were harder to get right… Again, it’s not the figurines themselves, it just the plan. 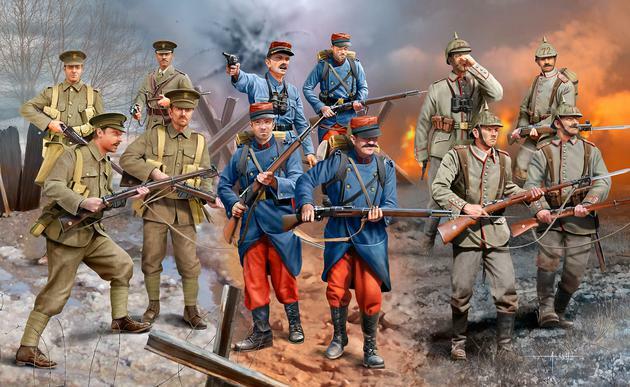 The French soldier is in the attire of the very first days of the war. 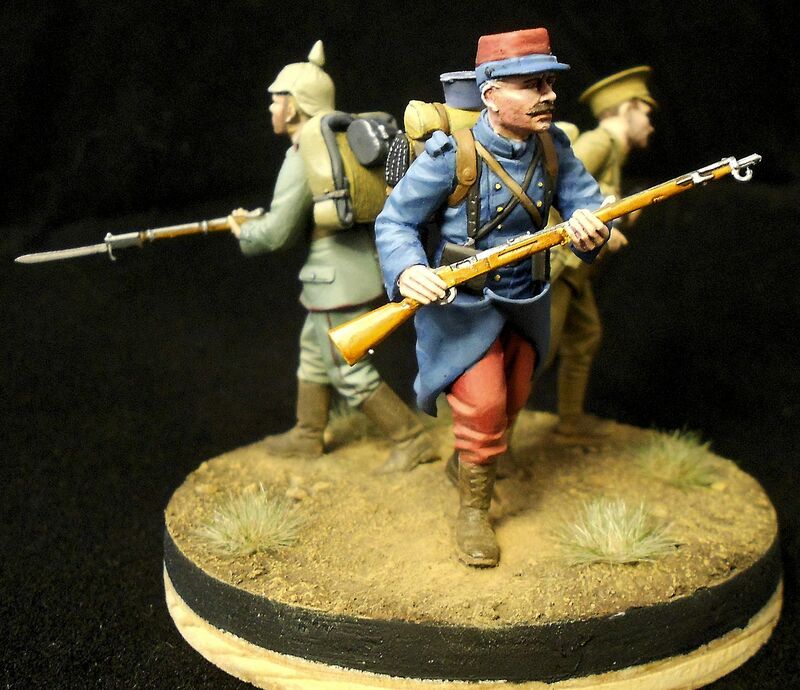 The uniform is the same as those of the French-Prussian war of 1870-71 and were hopelessly out-dated. 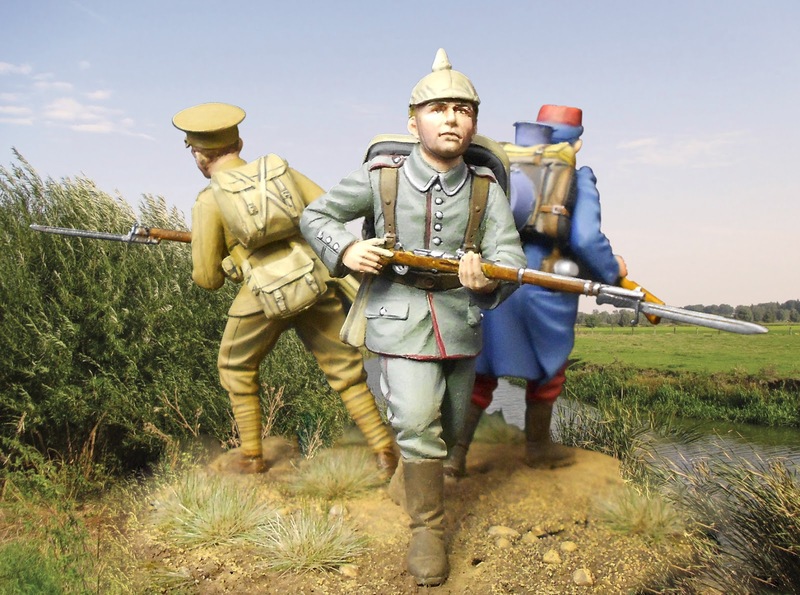 The soldiers, called “Les Pioupious” – The Young Ones – were dressed in blue caps and coats with bright red trousers. 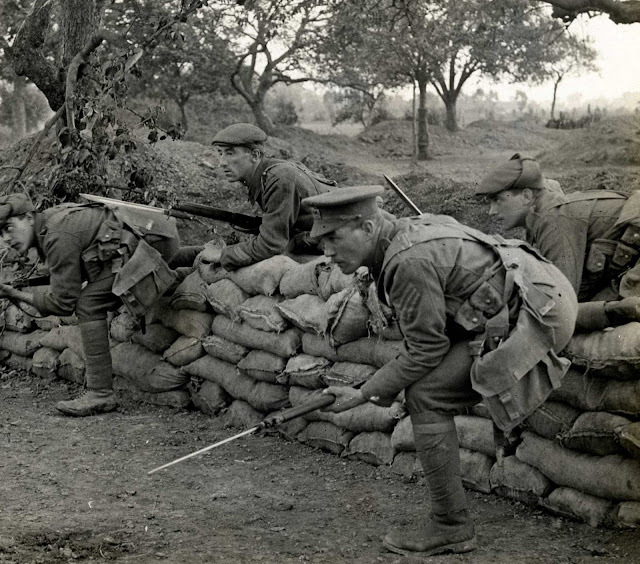 The rifle they carried was a 1886 Lebel rifle, which was out-dated as well. 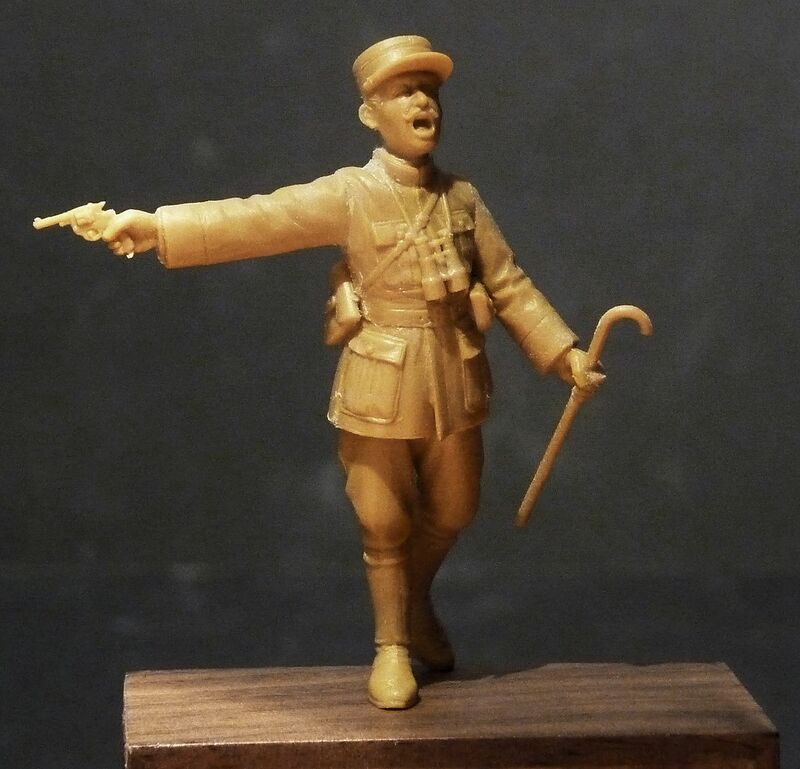 The French officer is much easier to construct and looks exactly like I would imagine a French officer would be at the front, complete with cane, gun and curly moustache. Before François started painting the figurines, we looked for some documentation. This showed that they were very accurately represented. The German soldier is very nicely moulded too and with some talent can be painted into a very convincing figurine. The end result of this test was very motivating indeed. And creative as he is, François made a little vignette, so the 3 soldiers could be placed together. This really is a set to recommend pretty easily. 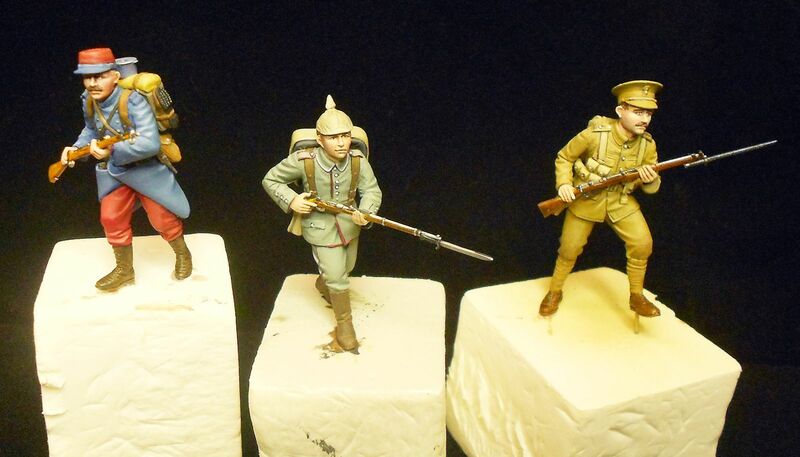 You get a lot of figurines and extra equipment like helmets, backpacks and weapons for less than 20 euro. You should take care with the plans though. I mean, everything is there to build some very nice looking figurines; it’s just a puzzle sometimes. 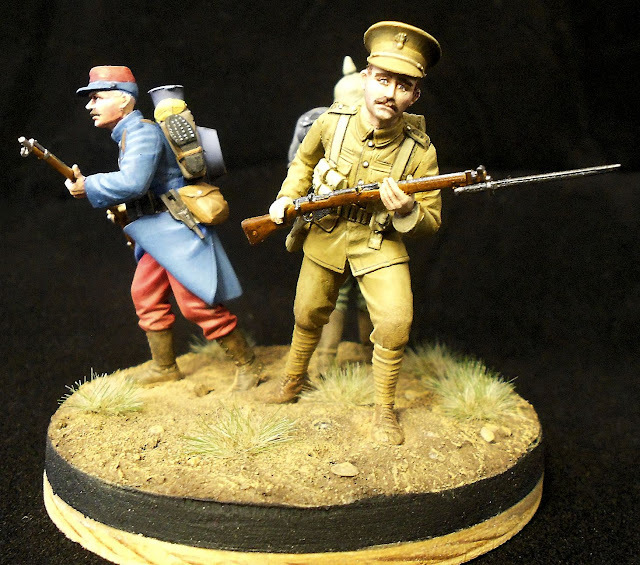 You don’t need to be a very good modeller to make them (that’s Nicolas) but some careful painting (that’s François) is needed. This set is very good value and you’ll have a lot of fun with them. They will fit just perfectly next to one of those World War I tanks!